For 5 generations my family was involved the livestock and farming businesses. Growing up in a ranching family meant I started working at a young age. On a ranch there is always something to do, bucking hay, feeding livestock, sorting and moving livestock, building corrals, repairing fences, the work never ends. Starting as young as I did, I thought it was normal. I loved waking up at the crack of dawn or even earlier if you were shipping livestock (loading livestock on trucks), working hard all day, eating some lunch and then heading home in the late afternoon. By doing this since childhood I naturally developed the discipline of getting up early. This doesn’t mean getting up later is a bad thing but for me rising with the sun helps me to feel connected to the natural rhythm of the planet. I love the quiet. Everyone is still sleeping or just getting up and the omnipresent background drone of town/city noise is just beginning to rise in volume….. Discipline is probably the most important aspect of becoming self-actualized. It is the key to mastering all the practices we need to implement to be free in our lives. Without discipline we cannot remain detached. We cannot maintain our integrity. We will not be able to accept what is. Thus, we will not be able to maintain the structure we need to live a free life. How do you find discipline? How do you become disciplined? Yes, it is a commitment but not in a negative way because in many ways you are already disciplined. For example, we all have underlying morals. We know right from wrong. You know what it means to do the right thing. This is an example of discipline. It may not seem like a discipline but it is. It is a deeper commitment to behave in a certain way, therefore a discipline. I view discipline as a sort of actuator. It does not have to be something that you take on begrudgingly. It is not something you do against your will, it becomes your will. I see it almost as a kind of filter. You allow a mindset of discipline to settle over you and become the filter through which you view and operate your life. In fact once you start allowing a little discipline to “take over”, it grows and expands. It becomes a part of you. It infiltrates every corner of your life. It enhances you, it helps you become the best you. 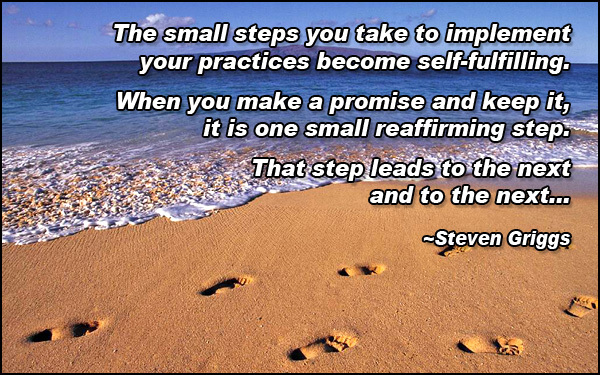 The small steps you take to implement your practices become self-fulfilling. The joy of being true to yourself by being disciplined brings a feeling of accomplishment that feeds you and encourages you to continue. It is not always a continuous path of success. It never is. It is a journey that requires restarts, regrouping and recommitting. Sometimes on a daily basis. But it doesn't matter and that’s the point of this. You become disciplined to maintain your discipline. There is no failure, only momentary lapses of discipline. Get up and get back on track.